Leaving Las Vegas, we headed out in search of aliens. There was a reported sighting in Rachel, Nevada – about 145 miles outside Vegas. Maybe it was the burning, hot desert sun or the long drive. 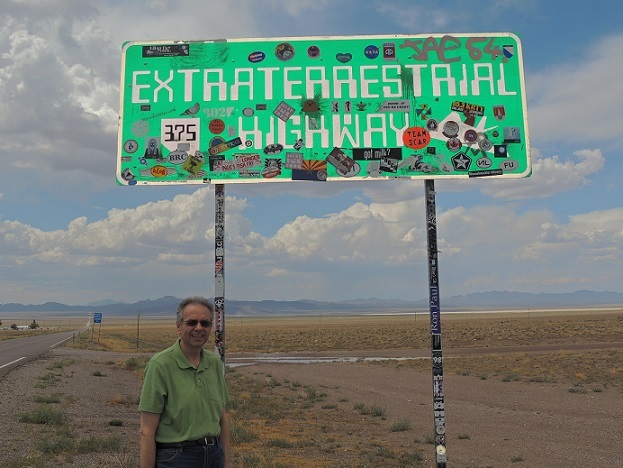 But on the way to the Extraterrestrial Highway (Route 375), I was shocked when I did see green. There were miles of green pasture and free-range cattle just off the side of the road. But that’s not what Dave and I came out here for. Then, we spotted it – the Little A’Le’Inn. It’s the travel destination for people across the world – and, perhaps, intergalactic travel. It became a popular UFO seminar headquarters, following reports by KLAS-TV investigative reporter George Knapp on Bob Lazar, who claimed he worked on flying saucers at nearby Area 51. 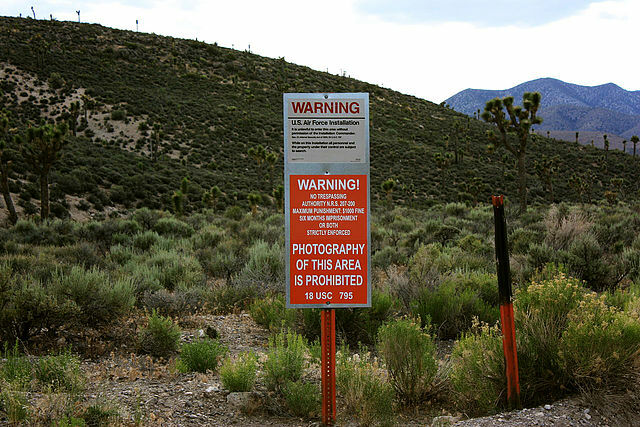 “Area 51, Dreamland, Groom Lake, the Ranch, the Box – all these names refer to the top-secret research installation located 100 miles north of Las Vegas that has prompted speculation about captured alien spacecraft and hidden bodies of extraterrestrial beings. 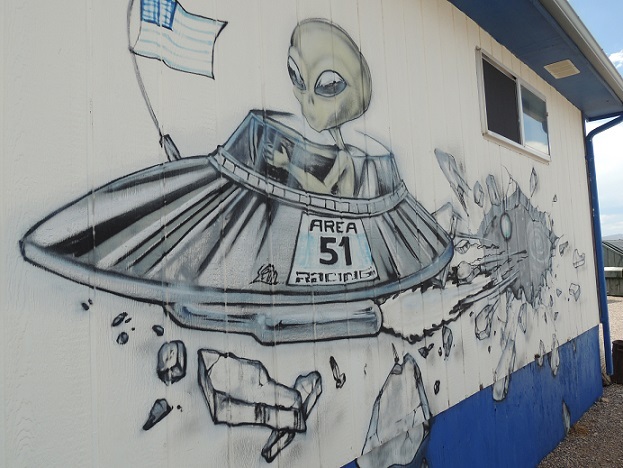 The facility and surrounding areas are also associated with UFO and conspiracy stories,” according to “Off the Beaten Path Nevada,” by Heidi Knapp Rinella. “George Knapp wrote about Bob Lazar in 1989, and it snowballed from there. (Our restaurant is) the destination stop for foreign travelers,” said owner Pat Travis-Laudenklos, who has owned the restaurant for 25 years. 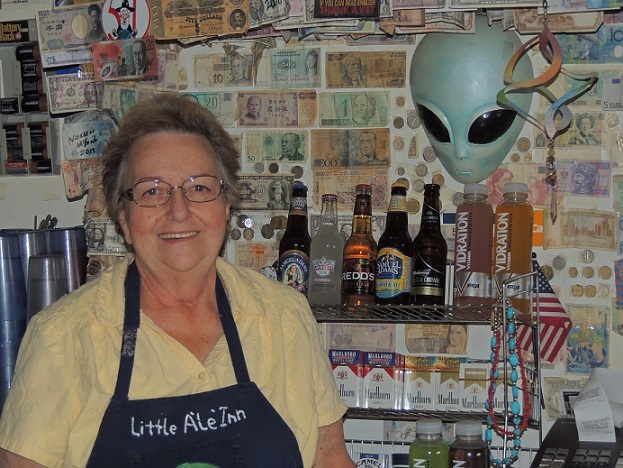 The international buzz prompted Pat Travis-Laudenklos and her late husband, Joe, to change the restaurant’s name from the Rachel Bar and Grill to the Little A’Le’Inn. in 1989. During our brief visit last month, we met people who had driven to the restaurant from Virginia, and visitors from Las Vegas and London. She estimates that they get a minimum of 200 visitors a day. The restaurant’s World Famous Alien burgers, Saucer burgers or Galaxy Wrap (low-carb) might be part of the appeal. The tourists said they wanted to see what the place was about before they went to Area 51. She’s no stranger to UFO sightings. As you leave this tiny town, you’d be well-advised to be careful on your drive – especially after sundown. You don’t want to run into any little greys, or risk a collision with a low-flying vehicle traveling at warp speed thru the night. I LOVE this, Judy. 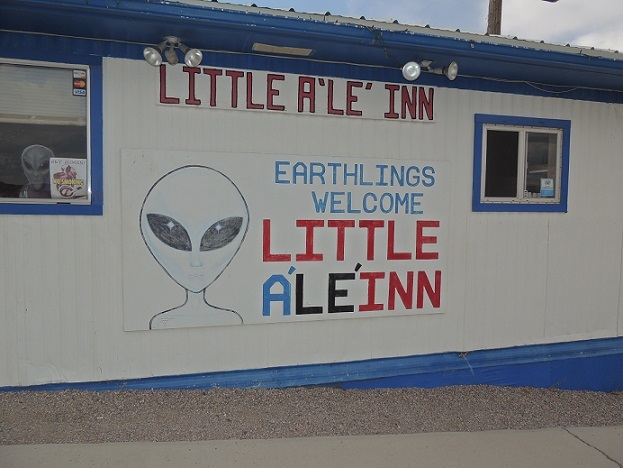 I thought Roswell was the “special” place, and now I want to visit Little A’Le’Inn (great name, and the pictures are terrific!) You did a thorough, real, wonderful and enticing job on this! If Roswell wasn’t so far from Vegas (768 miles), I would have loved to have gone there. But this little restaurant really has some history to it. It’s in the middle of nowhere and folks flock to it. Thank you, Marilyn. Glad you liked the story and photos. It was fun. Sounds like a fun, quirky place to visit. Good to know the height requirement for flying a spacecraft is under 4 feet. I’m just barely 5 feet and have difficulty driving some cars. Looks like I’d have no problem flying an alien spacecraft. Sounds like you had quite a trip out there, Judy. It was surreal to see this restaurant that is connected to UFO history. The folks there were a lot of fun. Great experience. Thank you, Kate. I rather think you would enjoy this place. Simply fascinating – every where you look – and it was a delight to talk with the owner. Your photo of the Futurohouse is cool. The “UFO’ has plenty of seating, but it doesn’t look very roomy. 🙂 I added the link to his blog so that you can check out the photos. A fun post, Judy. But what did you think of Las Vegas? The best attraction for me in Las Vegas is my brother. We had a great time dining out at Mount Charleston Lodge outside Vegas and at several other restaurants off The Strip. I will post later about our visit to the Mob Museum – very cool and well worth the time spent there. Plus Bellagio’s art gallery’s feature of Andy Warhol’s works. Las Vegas has much to offer.